Bert The Shirt and his ancient chihuahua, Don Giovanni: are front and center in Larry Shames's hilarious mystery novel, SUNBURN, set in Key West. Jeff's unbridled imagination explodes with whimsy in this depiction of a day in the life of the former great white whale chaser. 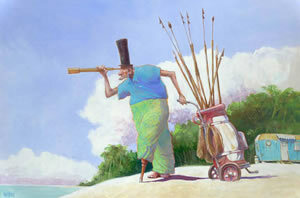 Originally this painting ran as cover art in The Key West Citizen. It's Jeff's homage to dogs and bikes everywhere. This painting also ran in The Key West Citizen. Jeff dreamt up these images from an actual article in the crime report that concerned an unusual event with the animals pictured. Just another day at the Key west Police Department. The ultimate icon of Key West. Jeff originally painted an unclothed bird but decided it was too boring. The Dragster emerged from his brush. Her legs are Susie's……no kidding. Jeff would get tired of drawing famous people but morphing animals with people was big fun. It stimulated flights of fancy. I'm sure Ernest Hemingway would have been amused! A full on view of the author as a feline. It looks exactly like him, too. Gator, Gator, Gator and Crock: Jeff's paean to lawyers. After divorcing three wives, you get the picture. Models Take a Break: Here's Jeff making fun of the famous painter Wyland. He paints huge, romanticized marine murals seen in South Florida and around the world. This painting has a "scenes we'd like to see" quality with the models on break in the bar next door, throwing back a few cocktails and having a smoke. Jeff did love a good cigar.